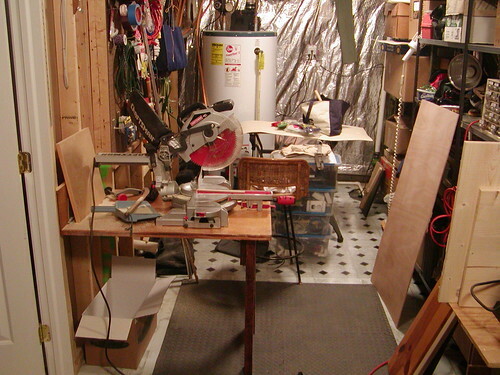 Not much to show and tell about my “sawdust” room. Can’t call it a workshop. Nothing exciting, nothing fancy… just trying to make its small size as functional as possible. It is 7’ wide and 15’ long in the basement with the utilities. The area had been framed by the previous owner so I left it. Mistake. Should have ripped everything out and started fresh. It’ll be a continual work in progress. It’s under our bedroom… but Mrs has yet to complain of any noise. 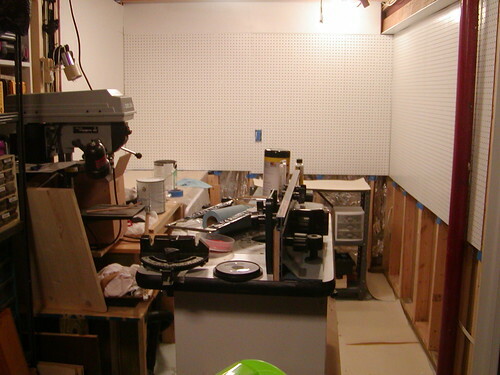 I needed to get tools out so I could find them… so I hung brown pegboard. Made the room too dark, so I added three light fixtures. Round fluorescent because of low ceiling and to reduce heat output. I made a rolling shelf unit to give me a little flexibility. This one holds a bunch and rolls fairly easily. The tool boxes are loaded and weigh a ton. Am I the only person who seems to collect redundant tools? I used plywood on the wall to better hang stuff. I have two fold out tables. 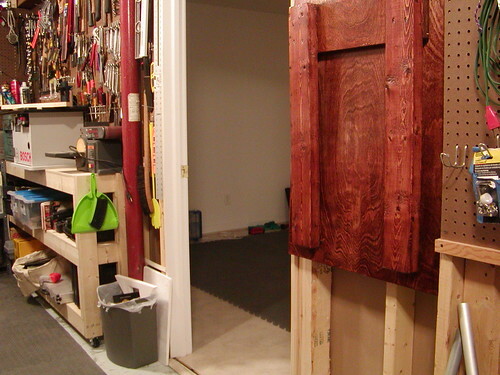 One is mounted at the bench, the other at the wall for tool use. I need all the workspace I can get. Painted the pegboard white to get some light. I enjoyed learning how to sharpen a plane... and then use it... getting the wood curls was satisfying. 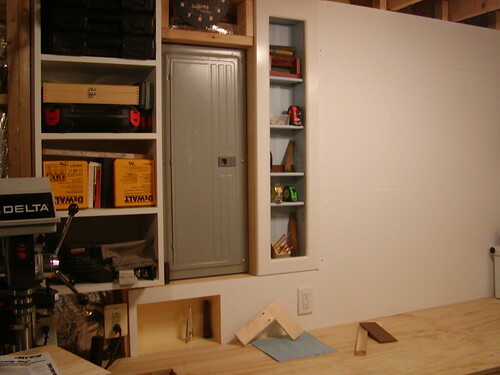 This is the unit for the recessed shelf by the electric panel made from scraps. It's recessed in the wall about 5 inches-- working to save every inch I can. 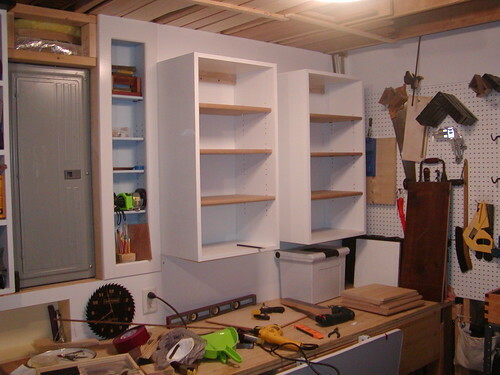 The small blue unit on the right has adjustable shelves and face frame. Would you believe the blue unit is made from bent and warped pressure treated fence boards... I salvage wood when I can. I kinda used the wall studs to straighten the shelf out... Just for fun I recessed a space and painted yellow trying to brighten things up. Very handy to push something out of the way, but you still want within reach. Made the wall cabinets using pocket screws and no glue. Hung with french cleats... simple. 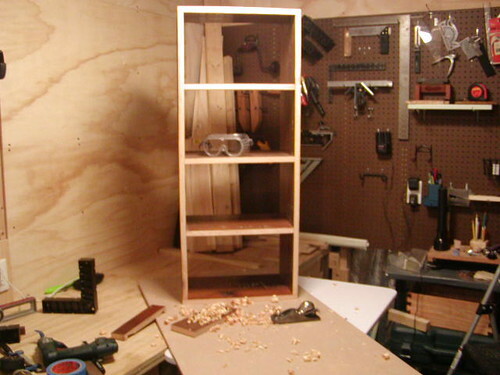 Decided not to do doors or face frame, but made the shelves adjustable. Convenient-- I can find things. They are loaded now so I am testing for strength. Pine boards, not ply. Seem to be fine. Wait and see. 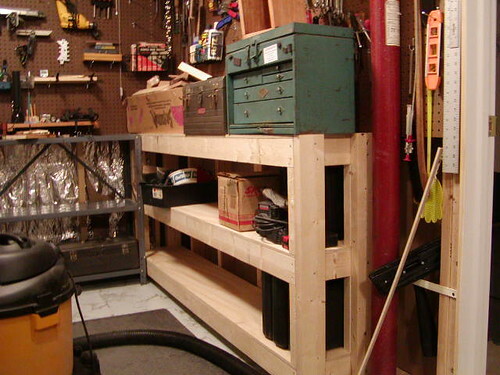 There is no ceiling since I use the rafter space above to store longer wood pieces. Low ceiling, easy to reach. Flooring... I put inexpensive self-stick vinyl tile on concrete floor. Non-slip to walk on and very light reflective. Saw dust sweeps up easily. It's holding up well, surprisingly. Very effective. The room is a mess... next major project will be to figure out dust control... that's a real problem. Surprisingly, I can actually find a tool when I need it. Not much looking around to do. Not far to reach, either. Your little shop is coming on nicely….well done. Looks like you have fun! Nice! the places we find to do our work ! looks like you are gaining on it , though . was the sports arena in phoenix . that is a shop space ! to crane out projects . and so is the money . Al, this looks like a nice space in which to work. You have done well with the space that you have and you have organized it nicely. 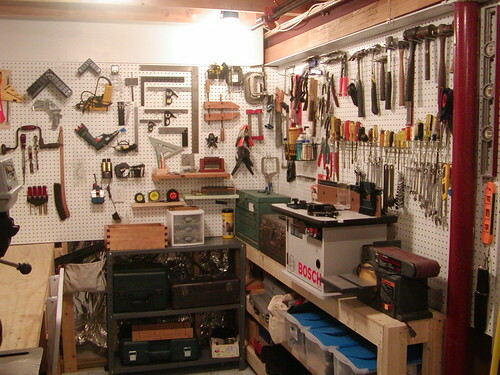 I like the pegboard that you added. 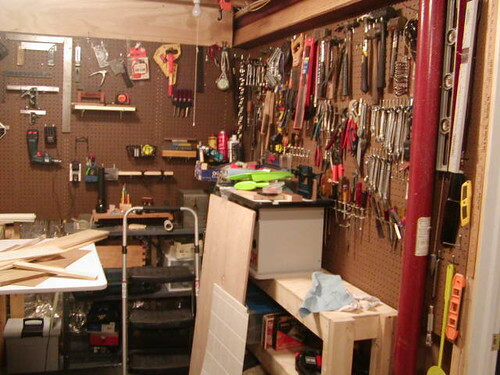 It helps organize hand tools and keeps them readily available while being relatively inexpensive to use. Painting it was an excellent idea. 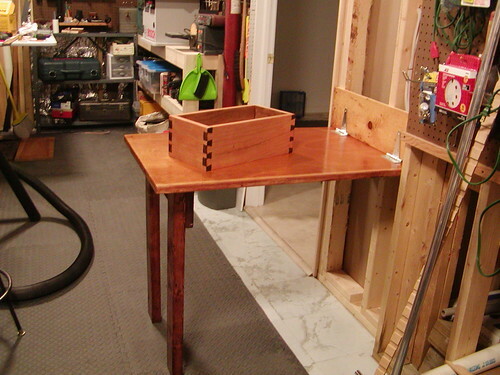 The folding tables are almost a necessity for those of us with smaller shops. They add valuable work space and do not take up important floor space when not in use. Putting down the tile on the floor is another nice idea. 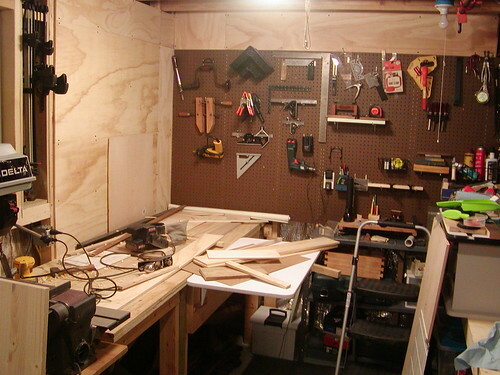 It not only improves on the shop’s lighting and helps with clean-up but it also just looks better too. I have come to the opinion that shops not only need to be functional but they can also look good too so I like the floor covering that you put down in there. You have a nice shop and I enjoyed visiting it. Al: A great work space. Glad that you are finding an area and a place to hide out. It looks like you are geting an area to your liking. I’ll have to come over and visit.